From our clinic based between Brentwood and Romford in Essex, we provide the broadest range of Dental Implant and Denture services. We also consult for other dentists across the county and into London. Innovative same day full jaw teeth replacement. 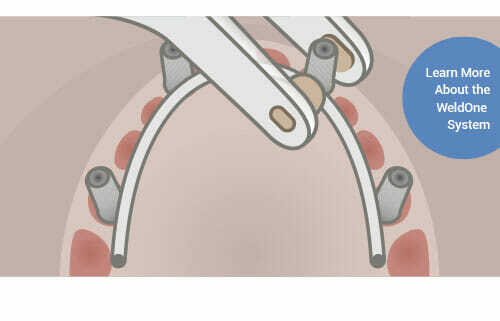 Restore the quality of life with our implant based system, they look and feel like your own teeth. The components of the Whole Mouth WeldOne Implant system are tailored for the individual jaw, making the base frame incredibly stable. Why Replace Them? Why on earth keep them? When you can have teeth that look and feel natural and allow you to eat and enjoy your food again. ‘All on 4’ supports a Full Arch Restoration on only 4 implants, and can reduce the need for surgical interventions such as bone grafting and sinus lifts. Andrew Fennell leads the dental implant team to deliver same day full mouth dental implants. Many people have been told in the past that they are not suitable for dental implants. But as we are able to treat almost any case, people come to us from all over the country for their brand new smile. The best Implants are solid, long lasting and can look and actually feel like your own teeth. Attached to the bone, dental implants give replacement teeth complete stability, particularly compared to the older methods such as gum mounted lower dentures. In many cases, the only thing worse than dentures is having no teeth at all. Although maintenance is just as important for Dental Implants as for your own teeth, with the proper care and attention, Dental Implants are proven to last for decades. And the failure rate of dental implants is extremely low, particularly for established systems. The following costs for Dental Implants are correct when written, but they can change and each case can be slightly different. We will provide written pricing for each dental treatment as part of our free consultation. You don’t have to be a member to have treatment at Winning Smiles.